Indigenous people and buffalo sharing the ecosystem. Buffalo habitat then and now. Land conflicts, then and now. Government (mis-)management of the herds. Founded by the late Lakota elder Rosalie Little Thunder, a central tenent of Buffalo Field Campaign's mission has always been to work with people of all nations to strengthen the tribal voice in managment decisions affecting the herds. Here we take an historical look at the inseparable destinies of native peoples and the buffalo (also called bison) they depended upon for existence. The slaughter of buffalo as presented by Nineteenth Century worldviews is perceived by many as a closed chapter in the history of the West. It is often viewed, when looking back from a comfortable distance, as a somewhat regrettable but necessary evil. Overwhelmingly, it is considered an event that is over, past. ...and that is the end of story. Or is it? What happened to the buffalo and the people with whom they had coexisted—in balance—for many centuries? The struggles between Caucasian and Indian, between cattle and bison, and between two strikingly dissimilar ways of life remain alive and strong today. The extirpation of the bison herds in the 19th century and the current harassment and slaughter outside Yellowstone National Park are closely related and fueled by many of the same economic motivations, personal fears, and misunderstandings. The bison were exterminated, in part, to create and maintain a dominant “cattle culture” across the Great Plains and the West—and, unfortunately for Native Peoples and wildlife—it worked. Even now, in the 21st century, many of the same forces are still in place. Learn more about the current harassment and slaughter of buffalo. 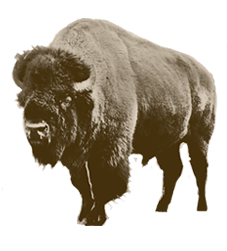 Buffalo once roamed from the eastern seaboard to Oregon and California, from Great Slave Lake in northern Alberta down into northern Mexico. Although no one will ever know exactly how many bison once inhabited North America, estimates range from twenty to forty million. The great herds were not decimated overnight. The slaughter was a gradual process, reaching its full momentum in the 1870s. 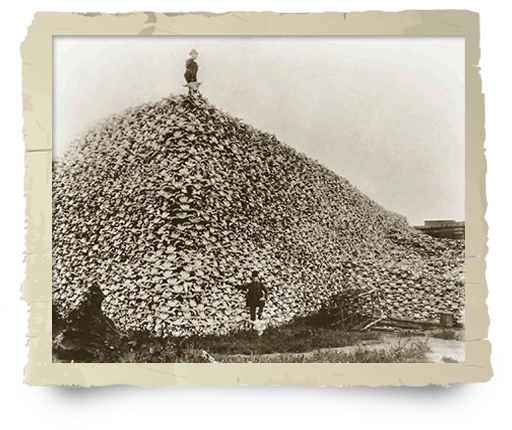 The Native Americans of the Great Plains had relied upon and hunted buffalo for thousands of years. Without the arrival of the Caucasians—and with them the gun, the horse, and the market for bison products—it seems likely the Indians could have lived sustainably with the bison far into the future. 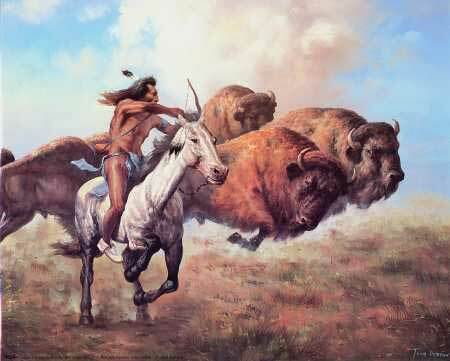 However, as the plains tribes acquired horses and guns from their southern neighbors—who in turn had received them from the Spanish—the Indians were able to kill buffalo with greater ease. As the market for buffalo (particularly hides) emerged in the 1820s—and as more and more European bison hunters came westward, the bison population began to decline precipitously. In the years following the Civil War, demand for beef, hides, and tallow skyrocketed as the country began to rebuild its economy and expand its industrial base. Meanwhile, industrialization created its own demand for buffalo hides, which provided a strong yet elastic material from which to make belts to drive machinery. A separate but equally powerful force were the growing middle and upper classes, which had a nearly insatiable appetite for beef—and the postwar economic boom gave them the buying power to satisfy it. 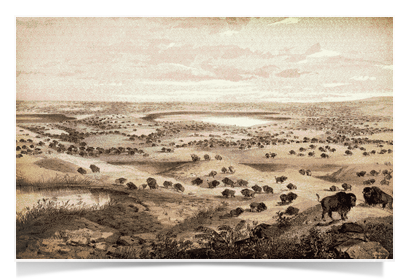 Texas alone could not meet the demand, so ranchers turned to the western plains for cattle grazing. This vast area had already demonstrated its ability to sustain large, healthy populations of ungulates. The Indians’ nomadic way of life, synchronized with the migrations of buffalo, deer, and elk, did not lend itself to the European notion of settlement and private property ownership. The ways of North America’s Indigenous People flew in the face of white attempts to fence and segregate tracts of land for individual use. The creation of reservations was intended to strip the Indians of their nomadism and establish clear boundaries between Indian and non-Indian lands. 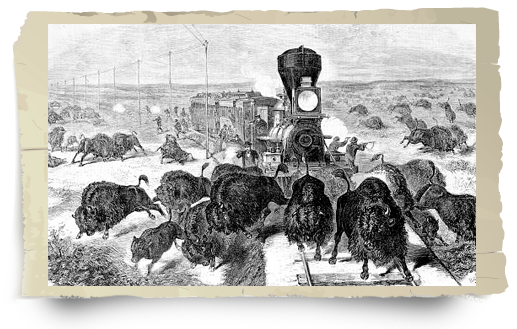 As cavalry fought Indians with rifles, cattlemen formed alliances with the U.S. Army, the railroads, and bankers to rid the west of both the buffalo and the Indian. Some treaties "protected" the Indian's right to hunt buffalo in perpetuity, but that would only be relevant for as long as the buffalo remained. Western settlers were threatened by the nomadic ways of the Plains Indians, who for thousands of years had lived migratory lives following the great herds of buffalo. To these people, the buffalo was the ultimate companion, providing food, clothing, shelter, and nearly every other material need. As the Indians depended so much on the bison for their existence, their very religions centered on the buffalo. The buffalo gave us everything we needed. Without it we were nothing. Our tipis were made of his skin. His hide was our bed, our blanket, our winter coat. It was our drum, throbbing through the night, alive, holy. Out of his skin we made our water bags. His flesh strengthened us, became flesh of our flesh. Not the smallest part of it was wasted. His stomach, a red-hot stone dropped in to it, became our soup kettle. His horns were our spoons, the bones our knives, our women's awls and needles. Out of his sinews we made our bowstrings and thread. His ribs were fashioned into sleds for our children, his hoofs became rattles. His mighty skull, with the pipe leaning against it, was our sacred altar. The name of the greatest of all Sioux was Tatanka Iyotake—Sitting Bull. When you killed off the buffalo you also killed the Indian—the real, natural, "wild" Indian. 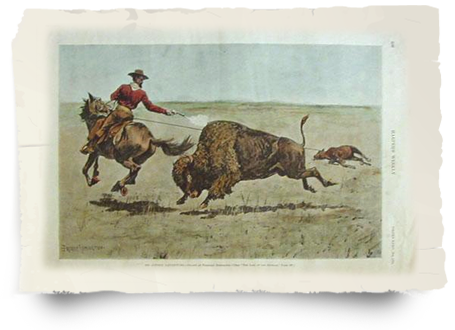 In the 1870s, more buffalo were killed than in any other decade in history. The three years of 1872, '73, and '74 were the worst. According to one buffalo hunter, who based his calculations on first-hand accounts and shipping records, 4.5 million buffalo were slaughtered in that three-year period alone. Buffalo Field Campaign exists to stop the harassment and slaughter of Yellowstone’s wild buffalo herds, protect the natural habitat of wild, free-roaming buffalo and native wildlife, and work with people of all Nations to honor and protect the sacredness of the wild buffalo. Do you agree that no more buffalo should be killed or harrased? 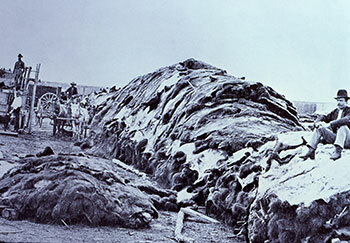 Influenced by all of the above, the U.S. government pursued a policy to eradicate the buffalo and thereby extinguish the Indians' very existence, forcing them onto reservations. If I could learn that every buffalo in the northern herd were killed I would be glad. The destruction of this herd would do more to keep Indians quiet than anything else that could happen. Since the destruction of the southern herd, which formerly roamed from Texas to the Platte, the Indians in that section have given us no trouble. If the Secretary of the Interior will authorize me to protect all other kinds of game [other than buffalo] in the far west I will engage to do so to the best of my ability. The testimony above, spoken by a U.S. Army leader of the Indian wars, clearly articulates their perspective—and their vision for the future: The buffalo and the Indian were obstructing the march of western civilization. 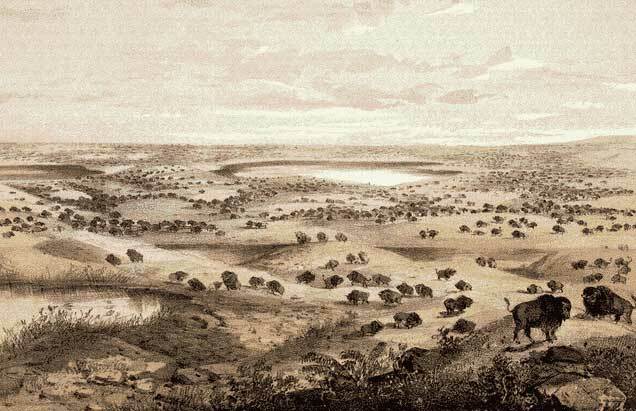 Kill the buffalo and not only would the Indian wars be won and the Indians made "quiet," but the vast tracts of public land would be opened for the cattle business. 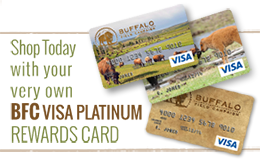 If you enjoy learning about Native Americans and buffalo, please sign up for the BFC enews!